(2016) Andermans veren. 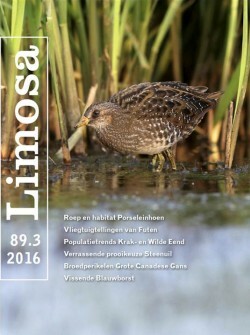 LIMOSA 89 (3): 138-140. Francksen R.M., M.J. Whittingham & D. Baines 2016. Assessing prey provisioned to Common Buzzard Buteo buteo chicks: a comparison of methods. Bird Study 63: 303-310. Gyimesi A., T.J. Boudewijn, R-J. Buijs, J.Z. Shamoun-Baranes, J.W. de Jong, R. Fijn, P. van Horssen & M. Poot 2016. Lesser Blackbacked Gulls Larus fuscus thriving on a non-marine diet. Bird Study 63: 241-249. Green R.E. & D. J. Pain. 2016. Possible effects of ingested lead gunshot on populations of ducks wintering in the UK. Ibis 158: 699–710. D'Alba, L, R. Maia, M. E. Hauber & M. D. Shawkey. 2016. The evolution of eggshell cuticle in relation to nesting ecology. Proceedings of the Royal Society, B 283: 20160687. http://dx.doi.org/10.1098/ rspb.2016.0687.